Home / Auto-Assignment/Agent Availability / How do I limit the number of Issues Agents are assigned? If you use Automations for Workflow Management to assign Issues to Agents during their working hours, you may want to consider setting a limit on the number of new Issues that can be assigned to those Agents. This prevents your Agents from being overwhelmed with too many new Issues at once. First, you’ll want to figure out the optimal number of Issues your Agents can manage at a time. You can look at your historical data in the Analytics section to figure out how many Issues your Agents work on in a given day. Compare the total numbers and factor in CSAT rating and Reopen Rate, and you should be able to find the ‘magic number’ of Issues that your Agents can handle. 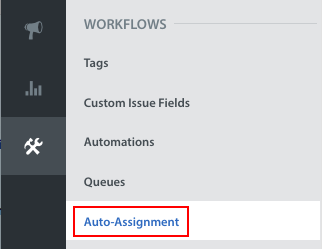 To set the maximum number of Issues, navigate to Settings > Auto-Assignment. Under the ‘Auto-Assignment Rules’ area, switch the ‘Limit Issues per Member to’ toggle to ON and enter a number into the text field to the right of the toggle. 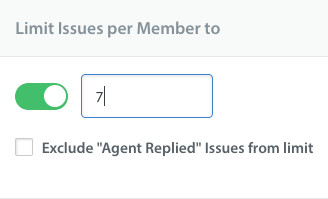 If you check the box ‘Exclude “Agent Replied” Issues from limit’, open Issues where the Agent has already replied will not be included in the maximum amount of Issues an Agent can be assigned at once.